Something you’re not going to find in model scale is fringe. It only has a handful of applications, but when you want it - nothing else will do. 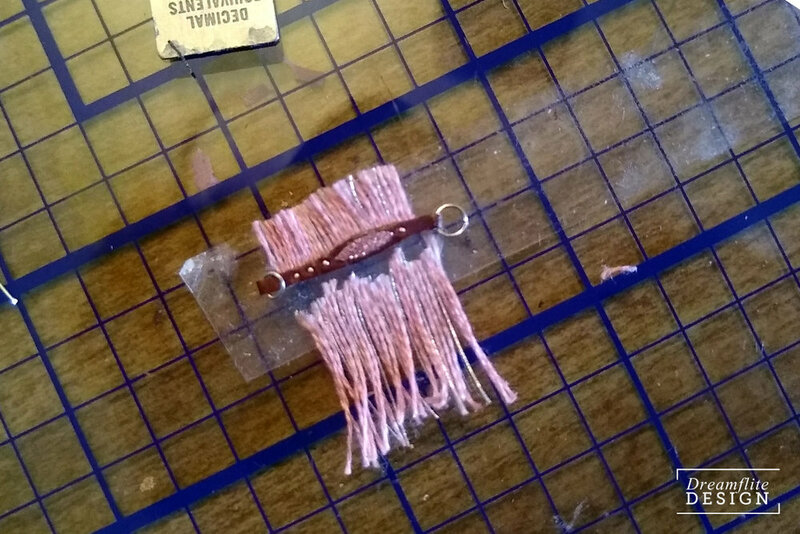 Here’s a quick and easy way to make string fringe in whatever color combination you need. Glue - I prefer Tandy Leather Bond but any glue that dries clear and flexible will suffice. Tissue-thin leather - this can easily be skived from scrap. Place the double-sided tape on your workspace. I like using my grid mat to give me defined boundaries. Remove some of the ‘tack’ from the tape by gently tapping it with your finger tips a few times - this will help the fringe pull up neatly later. Tack the top 1/8 or 1/4 inch of your thread to the tape. I’m alternating three strands of pink with one strand of silver. 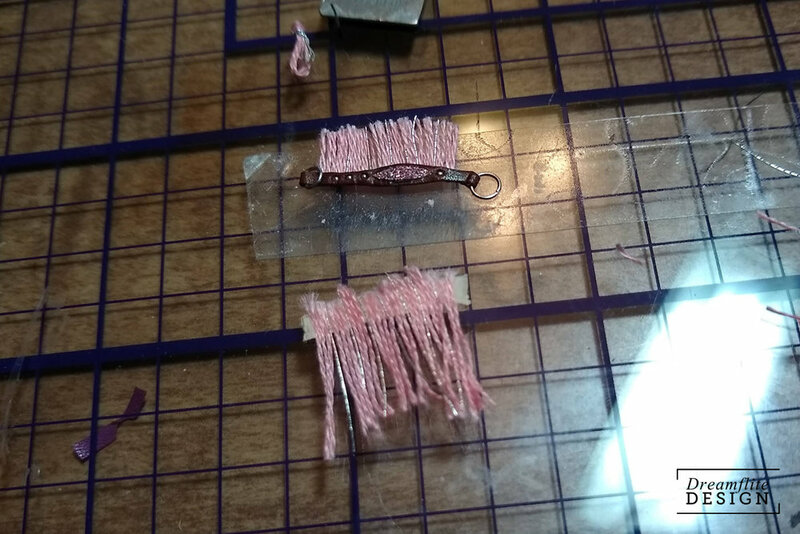 Tweezers can be helpful - use them to gently nudge the threads into place or to press the threads onto the tape so that you can avoid touching it with your fingers. Use your scissors to trim the ends; I left 1/2 or 3/4 of an inch. If using floss that’s been wrapped on a card, avoid using the turn; it won’t ever lay flat. Keep laying thread until you have the length you need. Refer to your project consistently to avoid doing more than needed; this fringe won’t store well. When all of your thread has been placed, apply glue to your thin strip of skived leather. It should be about as wide as the thread that’s stuck to the tape and about a quarter inch longer; about a quarter of an inch wide by an inch long, in my case. I have skived a piece longer than I need and applied glue only where I do. Place the leather, glue side down, over the threads on the tape and press firmly. Keep the leather as straight as possible. And then LEAVE IT. No touching until it dries! My leather is so thin that the glue has completely soaked through; this is okay. Once the glue has completely dried, gently peel the leather - and threads - off of the glue. If some threads come loose, that’s okay - use a toothpick to apply some glue to it’s place and tack it down again. Slow and steady is key. And there’s your fringe, ready to apply to your project! I’m using this fringe on a barrel racing breast collar. Glue is applied to the prepared collar piece and the fringe is placed - leather side out - on top, keeping the bottom edge of the leather as even with the bottom of the breast collar as possible. The raw top edge is trimmed flush and the rest of the fringe is evened up and brought to the correct length. Finally assembled, the fringe is pretty convincing! It really needs to be secured by glue on both sides, so I don’t recommend storing unused fringe for any length of time. Hope this was helpful! Psst - want to know how to do the silver studs on the breast collar? Read my blog post about micro beads! This breast collar is part of a donation to Candy Land Live 2019. If you follow my studio Facebook page or hobby account on Instagram, you'll have seen some of the new sales piece I've been working on. It's been a fun project - I'm refining skills, trying new techniques, and using new materials. If you follow my social media accounts or have signed up to receive studio email newsletters, this isn’t news. For the rest of you, happy day! I’ve been hard at work on a handful of sales pieces and they’ll be offered for sale on Nov. 26 - that’s Cyber Monday in the US, a popular shopping day. I think the final count (pending some last minute materials sourcing, eep!) will be 12 items made especially for this sale. They’re all small items and I’ve tried to offer a variety of disciplines and molds. There WILL be things for the Hazel lovers, and I’ve had a great time incorporating that new Rio Rondo hardware into my sales. In addition to the sales items, I’ll be reopening the studio shop and everything still left from the Not-Going-to-Breyerfest Sale of 2017 will be discounted, along with the English Saddle Guide and saddle pads that I typically stock. The sale will go live on the morning of November 26. An email will go out to the newsletter subscribers, so if you’d like to be among the first to know sign up here! International customers are welcome, as usual. Since the sale will be first come, first serve and things can get a little hectic, I’ll be releasing the sales catalog sometime before Thanksgiving Day (Nov. 22) and will be available to answer any questions I can prior to the sale. The catalog will be available on the website, an email will go out, and links will be posted on the usual social media outlets. I’ve had a lot of fun making stuff for this sale and I really can’t wait to share all of it with you! Life is finally settling down a little bit. To recap - in the summer of 2017, I announced that we were having a baby AND moving across the country. Since the last State of the Studio post, we've had the baby (who is now a whopping 8 months old! ), a few more California adventures, traveled back to the Midwest by way of the Utah National Parks, moved in to our apartment in Kansas City, and I have a tiny studio space set up.